Whitby darts ace Richie Parkin is back in business after a heart-to-heart with close friend and mentor Glen Durrant, who is currently starring in the BDO World Championships at Lakeside. He revealed that Glen had advised him purely to concentrate on the Teesside ranking events, win them – and watch the offers come flooding in. “I met Glen at the British Open, at times we are thick as thieves and he has helped me so much. “If it had not been for him, I would not have played county games – he is an unbelievable friend and mentor,” said Richie. Durrant, known on the circuit as Duzza, saw off Czech opponent Karel Sedlacek in the first round of the world championships this week and was yesterday up against pal Jamie Hughes in round two. Richie is in good form, winning two of out of his last three events, and aims to take that form into 2015 in a bid to get noticed. 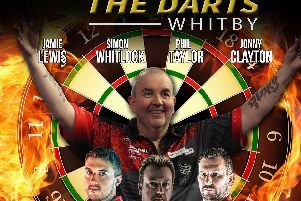 He will compete in the Teesside Open on January 24, a huge event with more than 12 dartboards hired at the Thornaby county venue. Richie is also considering taking part in tournaments further afield and will assess things in six months’ time. His original plan was to play over Europe to coincide with his 30th year until reaching a standstill with sponsorship, despite publicity in the Whitby Gazette. Howver, he thanks Drapers Carpets which has pledged some sponsorship for him this year.